Posted January 21, 2015 by Andler Dental & filed under Dental Articles. Cold drinks, hot soup, and a whole lot of pain. 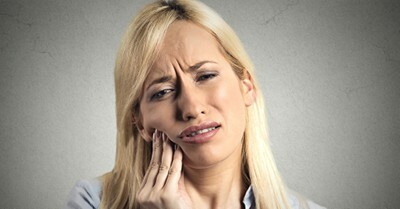 If you’re struggling with eating what you want without pain, especially if it’s common with hot or cold foods, you’re probably suffering from sensitive teeth. At my Madison dental office, we hear this often and we’d like to help. There are many reasons your teeth could be susceptible to pain while eating or drinking something hot or cold. One of the most common is the tooth’s root structure has become exposed. This anatomy of the tooth contains a lot of nerves, and when it’s open to contact with elements, the pain can be extreme. The root structures typically become exposed through gum recession or eroded enamel, both of which can be caused by grinding, a lot of acidic drinks, and even aggressive brushing. Toothpaste Choice. By simply changing your toothpaste, you can help ease pain caused by sensitivity. If you have sensitive teeth, it’s wise to avoid toothpastes that contain sodium pyrophosphate, which is found found many whitening and tartar-control pastes. Instead, choose a toothpaste that designed specially for sensitive teeth and use it regularly. Softer is Better. When selecting a toothbrush, make sure you choose one that has soft bristles. Hard-bristled brushes can contribute to wear and tear on the tooth’s enamel and put you at increased risk for sensitivity. Additionally, brushing too hard can lead to similar results. If your brush’s bristles are sporadically angled, chances are you’re brushing too hard. Easy on the Soda. And acidic juice and food. The more acidic the food or drink, the more damage to your tooth enamel and the more likely you’ll suffer from sensitivity pain. Choosing water over soda is always wise. If sensitive teeth are keeping you from enjoying the foods and drinks you love and you can’t seem to ease the pain, call my dental office in Madison . We’ll work with you to determine what may be causing your sensitivity and talk about proper treatments to get you back to eating and drinking without pain. Some common treatments may include application of a desensitizing agent, bonding, or sometimes a root canal. Accepting patients from Madison, Middleton, Verona, and neighboring areas.